" Don, this is part of the ‘Decca’ Neve you sold me around 18 years ago. 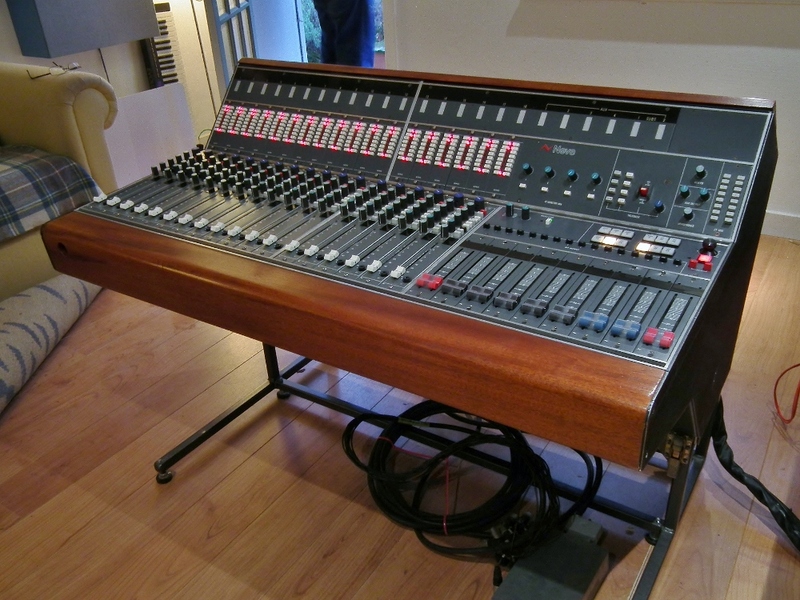 This is the transportable console used to record much of Decca’s classical output during the 1980s & 90s. The console dates from around 1986. It has 18 channels, 16 busses and a stereo buss. Mic/line (switchable) transformer balanced inputs, Gain, 3-band EQ (HF +/-15dB @ 10kHz, MID +/- 15dB @ 3k9, 1k8 & 820Hz (switchable), LF +/- 15dB @ 80Hz. plus Hi pass filter, 47/82/150Hz (switchable). 2 x aux sends, pan. All EQ and pan knobs are detented. P&G fader. Transformer balanced Direct Outputs on every channel. 16 buss outputs, busses 1&2 are the stereo buss. 7 x stereo line returns on P&G faders, routed to the stereo buss. There are 4 further aux returns (these are the ‘4T Monitor Mix' knobs & cut switches on the meter panel) which route L/R/L/R to the stereo buss. Any or all of the 16 output buss can be routed to the stereo buss via switches above the stereo buss fader. LED meters on all input channels etc. the comprehensive monitor section includes 2 x external stereo returns. Comms/talkback system and oscillator. There are Individual phantom power switches on the rear panel. Main Inputs & outputs on XLRs, busses & direct outputs on EDACs. Ideal for recording I the control room as the Kingshill power supply has no fans, and is in a separate flight case. Complete with all interconnects - i.e. EDAC - XLRs etc, and comprehensive schematics. Brazilian mahogany arm-rest and meter bridge cap. The Overall condition is A1, cosmetically and electronically. The module is based on the 542, but is unique - type 34155. I’ve recorded and mixed so many good albums on this console. Compact: 112.5cm(L) x 76cm(D) x 90cm(H). Heavy - 4-man lift. "